This planet can't protect us forever. Sooner or later, there'll be a catastrophe that renders this world uninhabitable for humans. And when that day comes, we'll need to know already how to live in space. There's little question that this is an important area of inquiry. We clearly want to venture out into space, but if we're going to do so, we'll eventually have to lose our dependence on Mother Earth. Colonists won't always be able to rely on a steady stream of supplies from Earth, which means they're eventually going to have to figure it on their own. Physicist Stephen Hawking suggests that our ongoing efforts to colonize space could ultimately save humanity from extinction. As it stands, Earth is our only biosphere — all our eggs are currently in one basket. If something were to happen to either our planet or our civilization, it would be vital to know that we could sustain a colony somewhere else. And the threats are real. The possibility of an asteroid impact, nuclear war, a nanotechnological disaster, or severe environmental degradation make the need for off-planet habitation extremely urgent. And given our ambitious future prospects, including the potential for ongoing population growth, we may very well have no choice but to leave the cradle. We're obviously not going to get there overnight — but here's how we could do it. As already noted, the first thing we need to do is develop a fully functional biosphere for long-term human occupation. We still haven't figured out how to do this yet, so it should be at the top of our priority list. We especially need to figure out ways to keep CO2 levels in check, maintain a steady internal temperature, avoid water acidification, and find a way to keep our sanity in check given the close confines. Once this has been done, we can start to think about going into space. The initial structure or set of building materials could be brought up from Earth (either by rocket or space elevator), or we could make it difficult for the astro-biospherians, by making them pull together all their materials from local sources such as asteroids (call it the ‘teach a man to fish approach'). But life in an orbital biosphere will present unique challenges. Growing plants in a zero gravity environment is possible, but difficult (they tend to sprout in bizarre orientations). There's also the problem of prolonged exposure to zero gravity on humans, and the long-term effects of solar radiation. That said, there are potential solutions to these issues. Back in 1974, physicist Gerard O'Neill outlined a freestanding orbital habitat consisting of large cylinders that would spin along an axis at a rate of one rotation per minute. This would result in a simulation of gravity along its inner surfaces. What's not known, however, is how long a human offshoot could live in Earth's orbit alone. It's conceivable that a self-sustaining base could function for generations, but that doesn't seem like a reasonable long-term solution for the future of human civilization — particularly if the home planet is inaccessible for whatever reason. But this is why we should also focus our efforts on building closed-loop systems on the Moon, Mars, and beyond. Back in 2000, NASA completed a $200 million study called the "Roadmap to Settlement" in which they described the potential for a moon-based colony in which habitats could be constructed several feet beneath the lunar surface (or covered within an existing crater) to protect colonists from high-energy cosmic radiation. They also outlined the construction of an onsite nuclear power plant, solar panel arrays, and a number of methods for extracting carbon, silicon, aluminium and other materials from the surface. More recently, NASA has also confirmed the presence of water ice on the Moon — a critical ingredient for any self-sustaining colony. Most of it resides at the Moon's north pole, but it's a fair amount — about 600 million tons worth. Assuming that the radiation problem could be addressed, it might also be possible to set up solar-powered farming enclosures. If we could start farming at the lunar North Pole, experts estimate that a 0.5 hectare space farm could feed upwards of 100 people. At the same time, however, there will be some considerable challenges. The Moon features a long lunar night, which could limit solar power and require a colony to withstand temperature extremes. The Moon is also low in light elements, namely carbon, nitrogen, and hydrogen. Low gravity (at ⅙ of Earth's) could prove to be a long-term problem. The Moon is also completely devoid of an atmosphere, and it has virtually no potential as a future terraforming project. At best, the Moon could serve as a good proof-of-concept station for future projects, or for a short-term stay in the event of a catastrophe on Earth. As NASA's roadmap suggests, a colony on the Moon could help us prepare for a mission to Mars. It would probably be wise to set up, test, and train a self-sustaining colony a little closer to home before we take that massive leap to Mars. And indeed, Mars holds considerably more potential than the Moon. It features a solar day of 24 hours and 39 minutes, and a surface area 28.4% less than Earth's. The Red Planet also has an axial tilt of 25 degrees (compared to the Earth's 29%) resulting in similar seasonal shifts (though they're twice as long given that Mars's year is 1.88 Earth years). And most importantly, Mars has an existing atmosphere, significant mineral diversity (such as ore and nickel-iron), and water. Actually, it has a lot of water. Recent analysis shows that Mars could have as much water underground as Earth. So Mars could provide an excellent place for humanity to test a closed-loop habitat — or to reboot its civilization, in the event of a catastrophe on Earth. Given all that Mars has to offer, it could conceivably support a colony living in enclosed habitats for an indefinitely long period of time. And depending on the technological sophistication of the society in question, it could also go about the long and arduous process of terraforming the planet. Assuming a no-Earth scenario, the colonists would have little choice but to plug away and be patient. Looker deeper into this scenario, the colonists would eventually have to weigh the pros and cons of their efforts. It might make more sense for them to return to Earth in hopes of salvaging things there — terraforming a broken Earth could prove considerably easier than terraforming Mars. Ultimately, it would depend on the condition of Earth, which could meet a grim fate in any number of ways, including a runaway greenhouse gas effect that could turn it into a Venus-like planet (which could make it much worse than Mars), nanotechnological ecophagy (a grey goo scenario in which self-replicating nanobots have converted virtually everything into useless mush), or an asteroid impact (which would only be a temporary problem). That said, Mars may not be the only terrestrial body in our solar system worth colonizing. Saturn and Jupiter feature a number of moons that could also be considered, though their proximity from the Sun could pose some problems. Finally, there's also the possibility that colonists will want to venture into deep space and find entirely new planets to inhabit — including Earth-like planets that are ready for immediate occupancy. Self-sustainability would have to be a key feature of the expedition, as the colonists would not be able to depend on the Earth for any resources. And as for knowing where to go, it would be akin to the Pacific Islander colonization campaigns of the past; just pick a direction and hope for the best. Predicting timelines for sustainable and permanent off-planet habitability is not easy — mostly because no one is really working on the problem. Most of our efforts assume that Earth will always be there, ready to jump in and support any colony that needs help. But assuming that we could focus our efforts, it's not unreasonable to assume that we could develop our first self-sufficient biosphere right here on Earth by the end of the 2020s — if not a lot sooner. It's been nearly 20 years since the last Biosphere 2 project, and there's a good chance that today's science and technology can solve many of the problems we experienced during those missions. 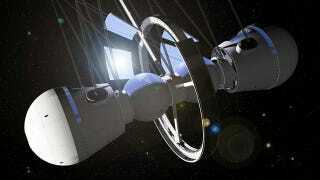 Once that has (finally) been done, it's entirely possible that self-reliant orbital habitats could be constructed during the 2030s. By that point, our technologies will be advanced enough that any unsolved problem could be addressed by A.I. or sophisticated modeling techniques. At the same time, advanced 3D printers and molecular assemblers (aka "fabs") will make life appreciably easier for colonists working in space. After this stage, the technologies required for setting up closed-loop colonies on the Moon, Mars, or elsewhere would largely be in place. So, assuming no social upheavals or other unpredictable events, we could be capable of living permanently and independently off-planet any time after 2030 or so, and certainly no later than the 2050s. There is another, albeit more radical, way for us to ensure our ongoing existence in the event of civilizational catastrophe. Assuming that uploads will someday be possible, it would be wise to "backup" human civilization off-planet. This idea was initially proposed by author Vernor Vinge, who suggested that we bury a supercomputer on the moon (or elsewhere) that could house an entire civilization. Alternately, this uploaded civilization could be sent on a mission into deep space in hopes of reviving a new society elsewhere. But given the highly speculative nature of this possibility — and knowing that a disaster can strike at any time — we should continue to work on viable solutions for purely biological humans. All this said, these timelines and predictions assume, of course, that we actually care about building self-sustaining habitats. As history has repeatedly shown, our ability to do something doesn't necessarily mean that we will. But given what's at stake, it's a prospect that needs to be taken a bit more seriously. Images via here, here, here, here, here.